Seriously I am sad. Worse of all, this is a serious matter, not just any one-off publicity stunt. The McDonald’s “Warm and sweet wedding package,” at HK$9999 ($1282) a pop, includes wedding gifts, pink invitation cards emblazoned with golden arches, decor featuring the likes of Ronald McDonald and the Hamburglar, and classic golden arches fare worth up to $385. Additional items will cost extra, including a “white balloon” gown rental ($165), balloon corsage ($11), balloon wedding cake ($88), and a large pink McDonalds backdrop ($321). For all the details check the official site out. This is really not a joke. While I can understand the difficulties of organizing a wedding in Hong Kong and the high costs that are involved, I don’t see why anyone would need to sink to the level of Mickey D’s. There are plenty of more practical and cheap alternatives on the market. According to McDonald’s there are two wedding parties confirmed for this year and around 70 other couples in talks. I am highly skeptical of how many couples are seriously replacing their wedding banquet with McDonald’s. Most likely, McWeddings will just be the first course for those couples who want to show everyone how “special” they are. So what’s next? KFC? Taco Bell? 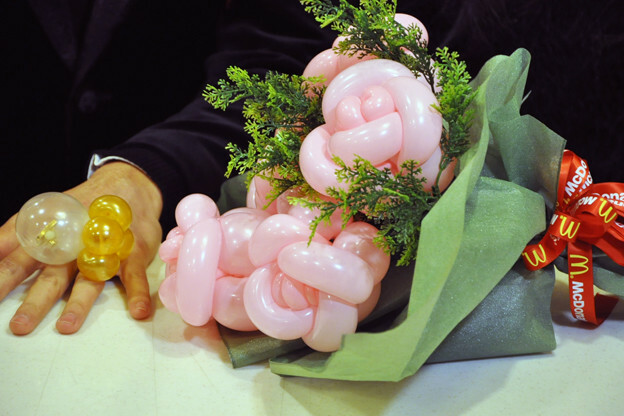 Nothing says i love you like balloon wedding rings! Do you have a problem with McDonald’s?